Hello there! 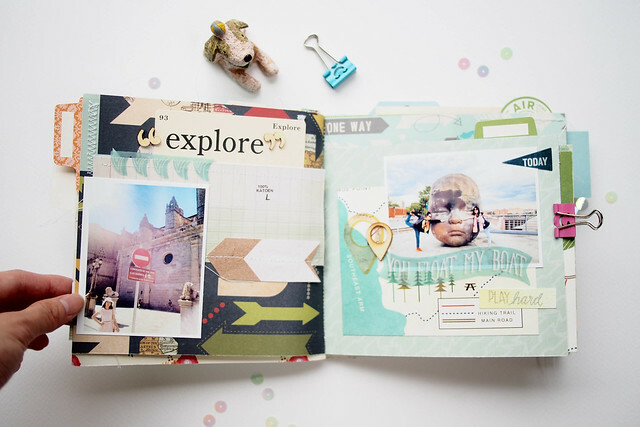 Its Sam today to show you one of the simple way to incorporate a mini album into your Project Life album. 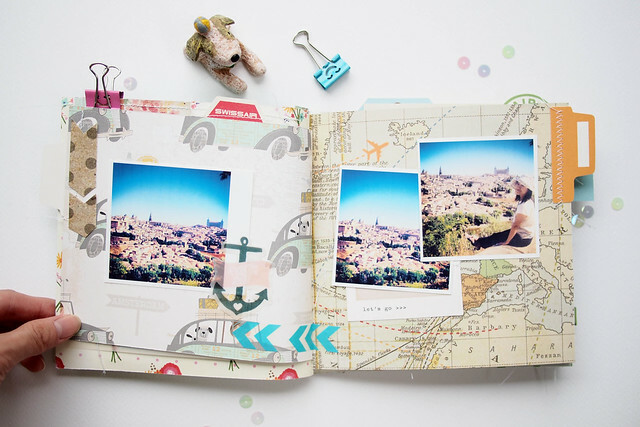 I always like to make mini album to store all my travelogue, photos and memorabilia from my trip. When there's a week that I actually went travelling, I would prefer making a mini album and slot it into the respective weekly PL spread. 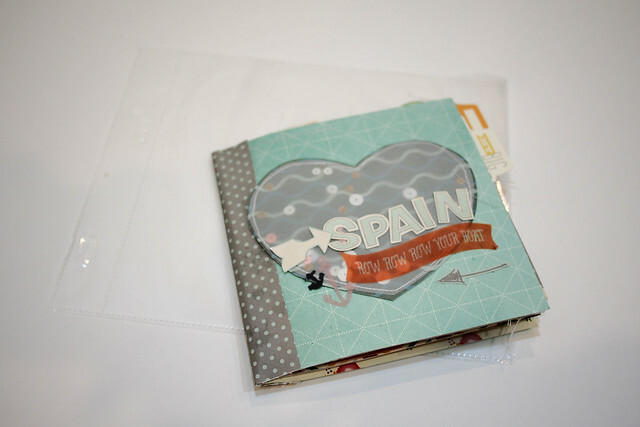 And here is the mini album I made for my friend's Spain trip using July Main kit and add-ons. 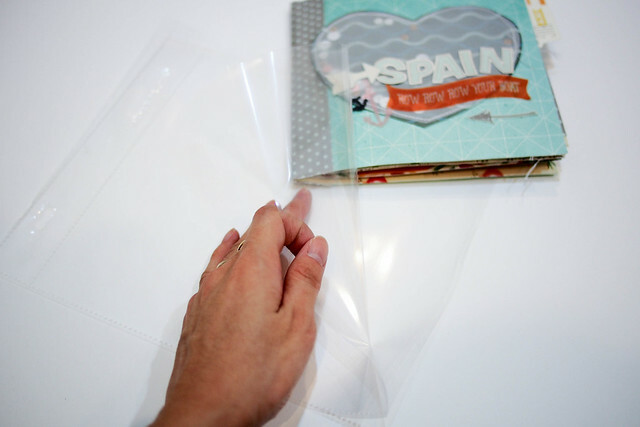 And today I am going to show you how to modify the normal 8.5 x 11 inch (letter sized) page protector to fit my mini album that measures about 7 x 7 inch. This is how it looks like when I fit it into my normal weekly spread. 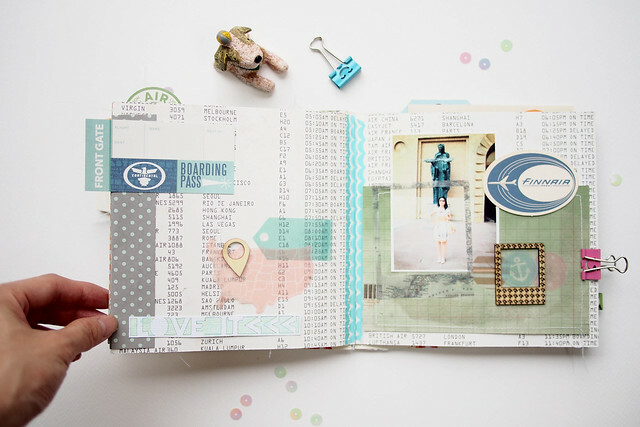 This simple strategy tutorial is totally inspired by Kasia on how she stores her layouts. 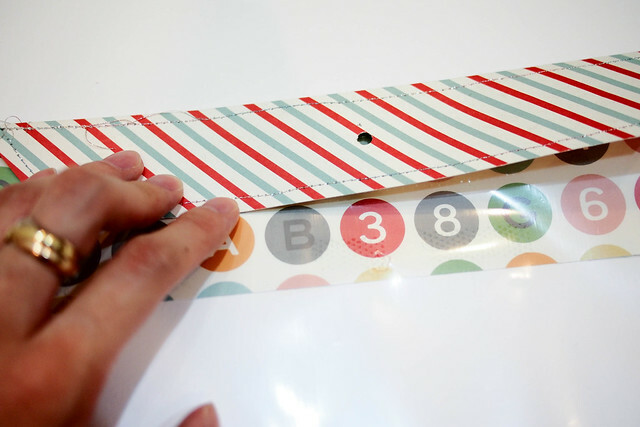 Firstly cut paper stripe measuring 6 x 12 inch, fold at 2 inch mark (on the short side). 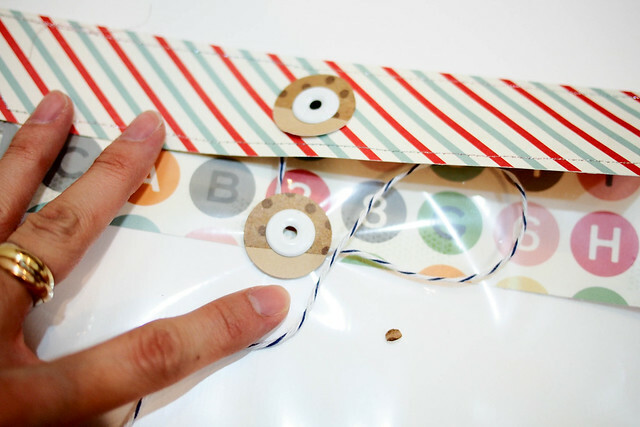 Then punch two 1-inch circles and punch each a small hole in the centre of the circle using Crop-a-dile. 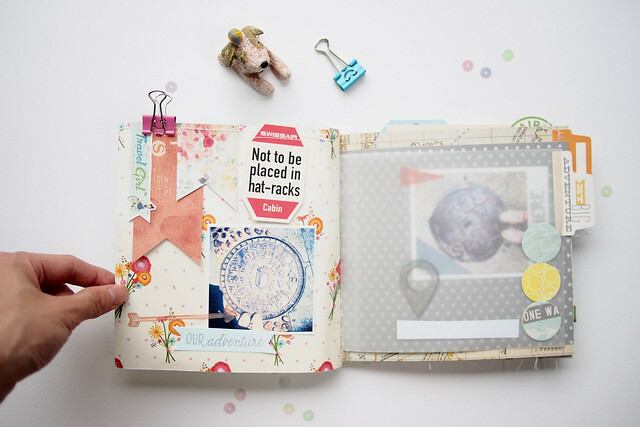 Move on to trimming the height & width of the page protector to fit the album snugly. 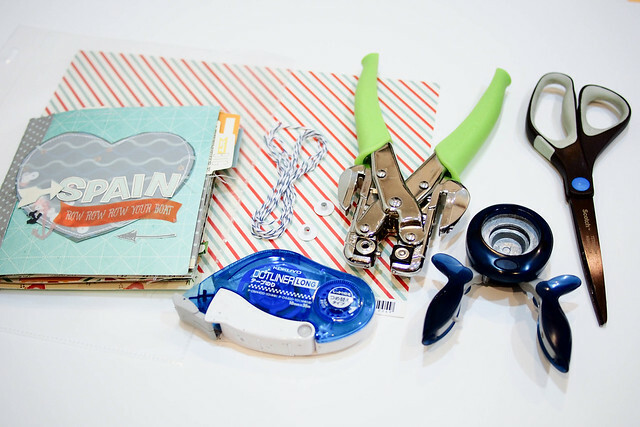 You could skip this step if you do not have a sewing machine. I eyeball the length (top & side) that needed to be trimmed down. You could leave about 1/2 to 1 inch extra room for your album. 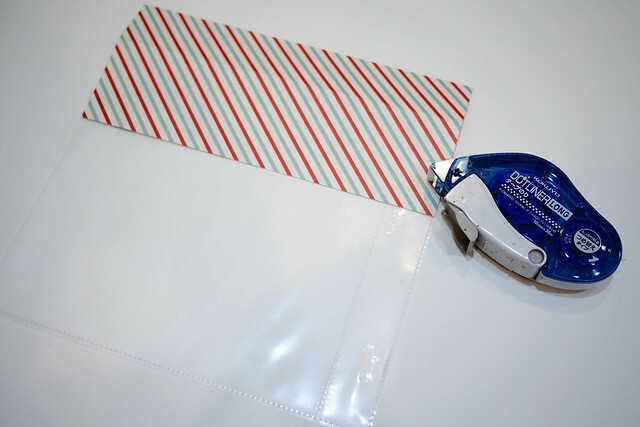 Then use tape glue to stick the paper stripe to the back of the page protector. 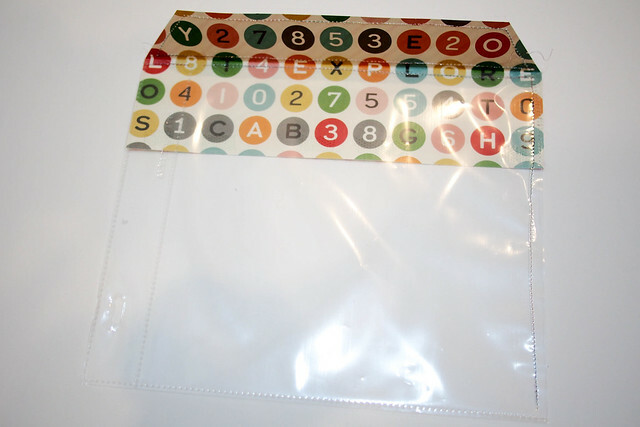 You could staple it down or stitch with sewing machine to make sure the paper adhere to the plastic sleeve. I trimmed the corner to make it looks more like an envelop and stitch all the corner. 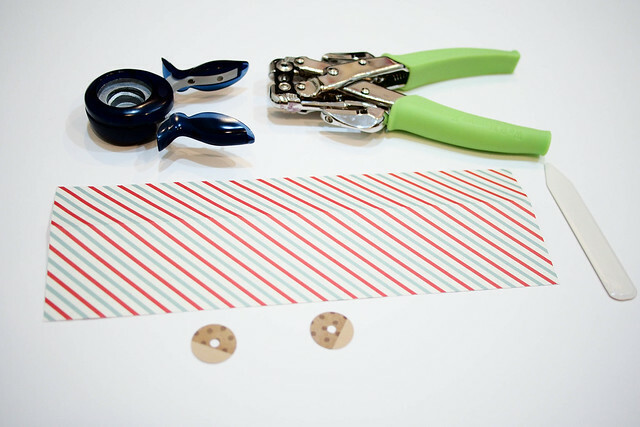 Again, you can skip this step if you do not have a sewing machine. Punch a small hole in the middle of the front flap & plastic sleeve . Again, I eyeball the placement of the hole. Add the 1 inch circle & eyelet on the hole and set it with Crop-a-dile. Then wrapped twine around the bottom circle. Here is the final product. A thinner album would fit into this sleeve nicely but I went crazy adding embellishment to my album. 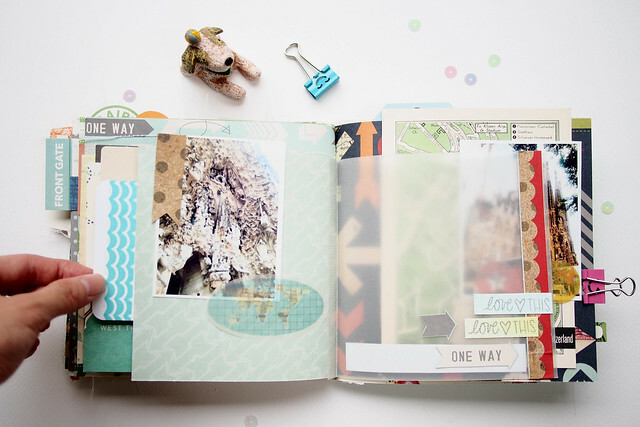 If you have any question about customizing your own page protector, do comment and ask! And now I would like to share photos of my album here. I use the pastel blue chalk ink to color the '&' wood veneer. 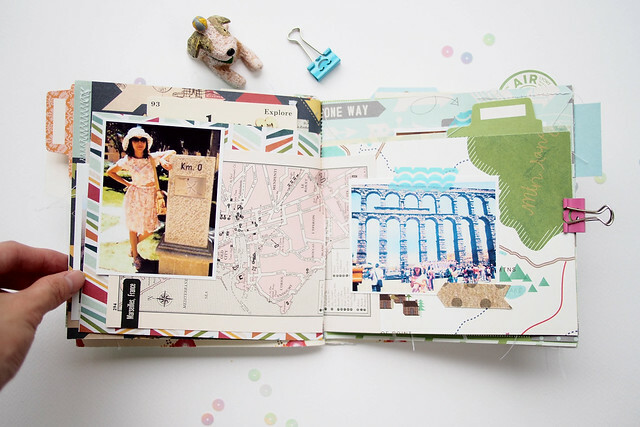 Inspire by the vellum die cut from Studio Calico Atlantic collection, I added vellum pages too. Thanks for looking and readinf such a long post! And I hope you have a great week ahead! Beautiful!! Thanks for the tutorial!! Your mini is beautiful Sam!!! I love it! Great tip on how to incorporate it into an PL album too!